We started on the HypergridUpper region of JokaydiaGrid. 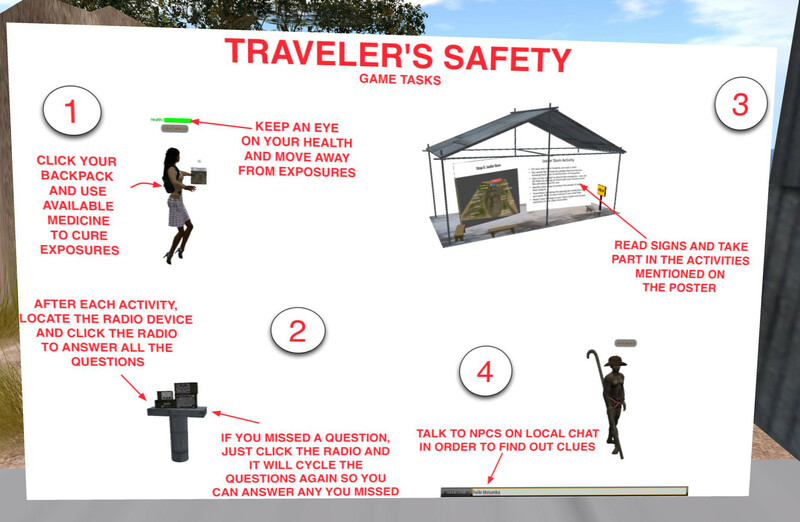 From there, we all jumped directly to the home of the East Africa Traveler Safety Simulation. 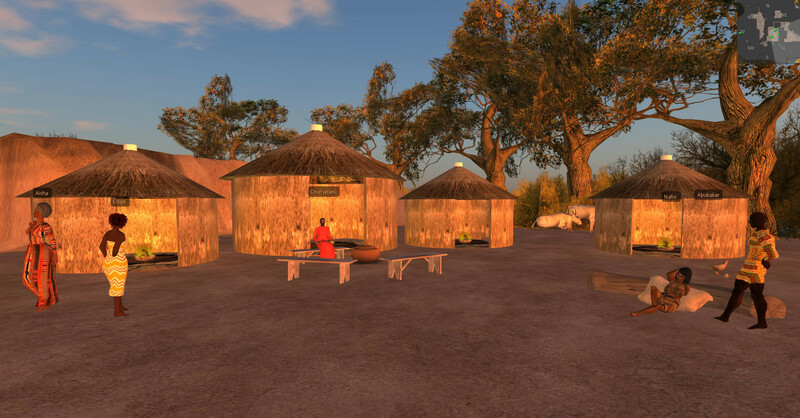 It’s a detailed environment that recreates the wilderness of East Africa and lets visitors explore a local village, slum and rescue center for children. 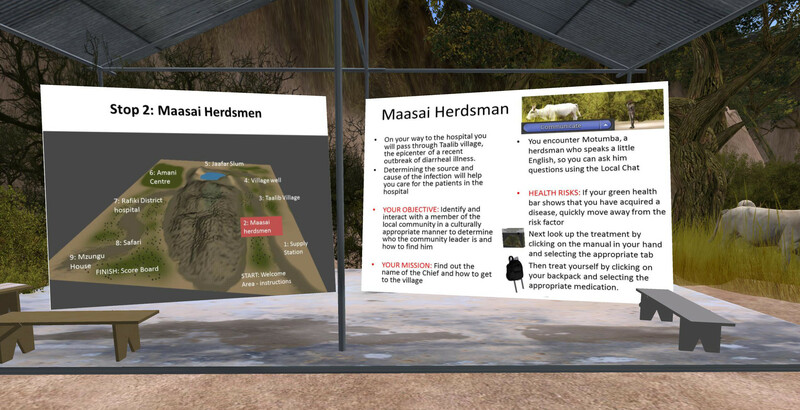 Visitors can communicate with computer-generated members of the local community (NPCs) in order to achieve objectives, learn about diseases and how to avoid them, and even take medications from a first aid backpack as a cure for when things go awry. 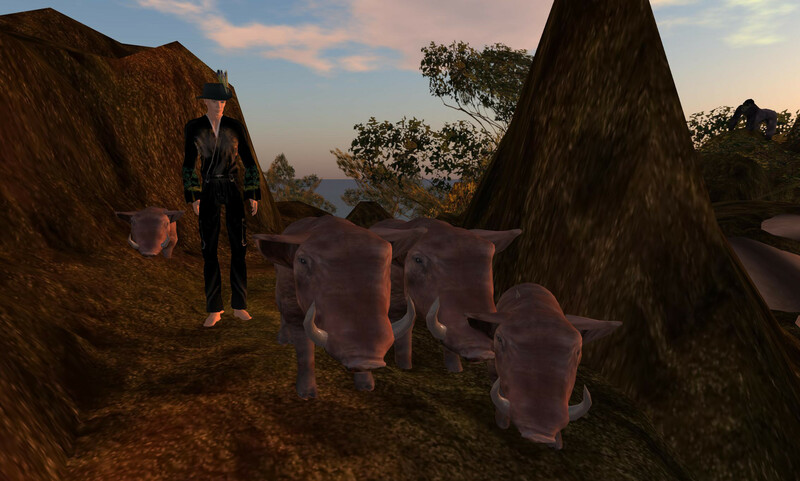 Combined with engaging quests and fun activities, it’s a wonderfully designed immersive learning environment. The lead designer Rachel Umoren (also known as her avatar Rachel Gloedu) is a pediatrician specializing in neonatology at Indiana University, and she was kind enough to meet us during the tour and help show people around. Thank you again, Rachel! After a while our group unfortunately got split up, and some hardy adventurers gathered with me on my Pathlandia Grid. From there I brought folks on a visit to the Speakeasy club on Littlefield Grid. 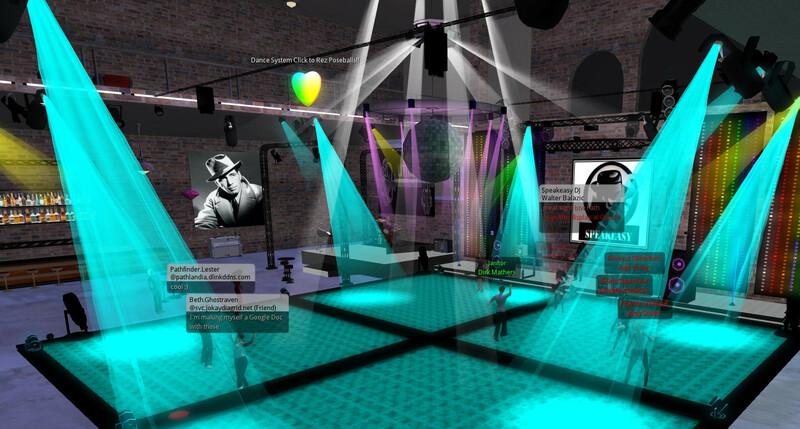 Littlefield is a very active grid with a creative and welcoming community, and every Saturday night at 11pm EDT they have a live DJ performing at Speakeasy. When we arrived the show was just starting, and the place quickly filled up with people. Good conversations and excellent music made for a fitting end to our tour. 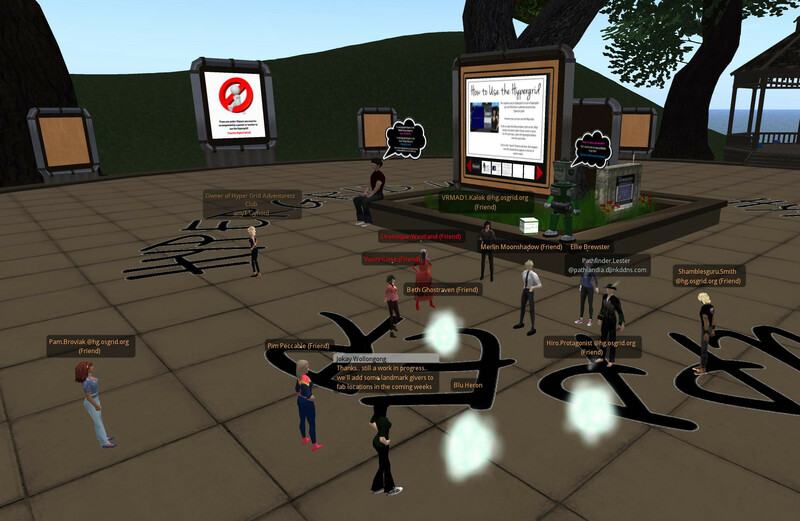 Arriving at the beginning of the Speakeasy event on Littlefield Grid. 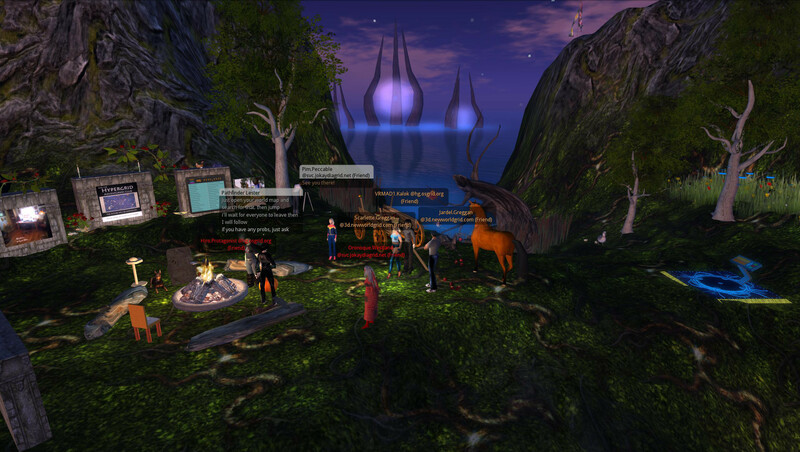 By the time I left, the club was packed with about 25 visitors! Thank you everyone who joined us on our excursion. I hope you all had a good tine, and I’ll definitely be organizing another tour in a couple weeks or so. If you’d like to join us on an upcoming tour, be sure to join our HGAC Google Group Mailing List for announcements. Don’t know how to Hypergrid Jump? No worries, it’s easy! Open your World Map in your viewer (I highly recommend Singularity). This entry was posted in Announcements, Hypergrid Adventurers Club, OpenSim, Virtual Worlds and tagged avatars, education, HyperGate, HyperGrid, Hypergrid Adventurers Club, jokaydiagrid, metaverse, online communities, OpenSim, opensimulator, second life, virtual worlds by John "Pathfinder" Lester. Bookmark the permalink.